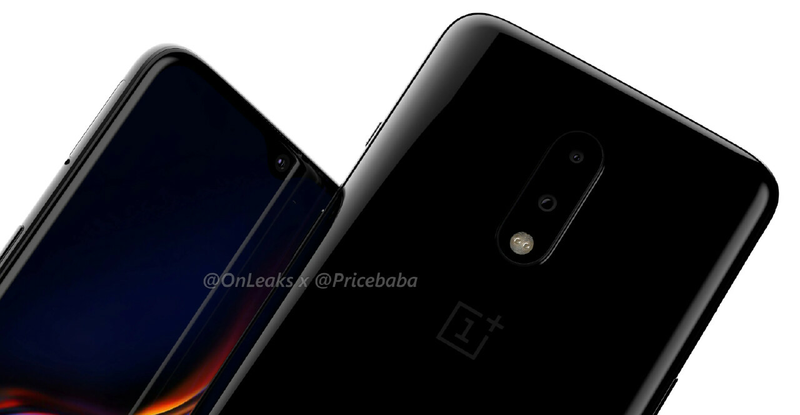 Way back in January, a mysterious image appeared online showing what appeared to be a bezel-less OnePlus 7 and last year’s OnePlus 6T. Naturally, there was quite a bit of skepticism surrounding the leak, but last month Steve Hemmerstoffer confirmed the bezel-less smartphone’s existence with a 360-degree render video. This, however, wasn’t the full story. which has been the subject of multiple rumors lately. Taking a look at the front of the OnePlus 7, at first glance it’s almost impossible to tell it apart from last year’s OnePlus 6T. In fact, the upcoming device seemingly sports the exact same display as the latter, meaning users gain access to a waterdrop-like notch above the display and chin below the panel. In terms of actual size, Steve Hemmerstoffer has stated that the OnePlus 7 will come equipped with a slightly smaller 6.2-inch display. But considering the smartphone’s dimensions (157.7 x 74.8 x 8.1mm) match up almost perfectly with those of the OnePlus 6T (157.5 x 74.8 x 8.2 mm) it seems more likely that the next-gen flagship will feature a 6.4-inch panel like its predecessor. Despite all of the similarities, upon closer inspection there is one key difference in the form of the in-ear speaker grill. On the OnePlus 6T there is a small cutout which matches the width of the notch, but on the OnePlus 7 a much wider speaker grill has seemingly been adopted – it matches the speaker found on the OnePlus 7 Pro – thus suggesting that the smartphone may support a stereo speaker setup. A quick peek at the OnePlus 7’s rear unsurprisingly reveals even more similarities. Once again, the flagship sports a glass construction paired with a OnePlus logo in the middle of the panel and a vertically-aligned dual-camera setup. In order to create a slightly sleeker look, though, OnePlus has elongated the camera module slightly to now include the dual-LED flash. As for sensor specifications, nothing has been revealed yet, but word on the street suggests the next OnePlus flagships will feature 48-megapixel primary cameras on the rear. It’s unclear what resolution the second sensor will sport, but it should once again be a dedicated depth sensor. However, if OnePlus wishes to compete more directly with other flagships it could swap that out for a telephoto camera or a wide-angle alternative. Elsewhere on the exterior side of things, the OnePlus 7 should once again include a volume rocker on the left side and a power button and Alert Slider on the right. Towards the bottom should be a speaker and a USB-C port. Unfortunately, there’s once again no sign of a headphone jack. alongside the OnePlus 7 Pro – this model will support 5G networks in certain markets – with sales then commencing around one week later. Pricing remains a bit of a mystery at the moment, but the new device will probably be priced in the region of $579 to $599, representing a slight increase over the OnePlus 6T which starts at $549. For this price, consumers should receive Qualcomm’s latest and greatest Snapdragon 855 which can also be found inside the Galaxy S10 series and LG G8 ThinQ. The smartphone is also expected to ship with a minimum of 8GB of RAM and 128GB of storage, in addition to Android 9 Pie and OxygenOS straight out of the box. The battery capacity remains a mystery at the moment, but it will likely match the 3,700mAh battery found inside the OnePlus 6T.